A brother and sister, I can hear it now. Her brother got on his bike and off he went in the country field in Hanover, Virginia where they lived. She was still learning and though could not ride yet, said to herself I’ll give him about 20-30 yards or so head start then I’ll catch him, running. And she did. I am sure when he saw her out of the corner of his eye, his jaw did a ‘Wile E. Coyote’ pavement drop as Meg sped by, on foot. The story of Meg Cross Menzies, her faith, her family, and her love of running. With the fifth year approaching of Meg of lifting us all up on an Angel’s Wings I recently had a chance to sit down with her Mom, Pam Cross, and talk about Meg, her family, and the glory that has come out of ashes with Megsmiles and the impact she has made. Her family never dreamed their daughter would have carved her name on so many hearts, including my own. What was Meg as a kid like? The middle child of three between her two brothers, Wirt and Howard, of Pamela and Wirt Cross. She was quiet, humble, sweet, kind, loved being on a farm in the country and being outside, being with her Dad, riding the tractor. I picture it as a scene akin to Little House on the Prairie. Meg started running in the seventh grade and just kept going. One of her high school teammates shared with me about running with Meg that as fast as she was in high school she just kept finding new strength and soaring, getting better in the years that followed. Meg’s Christian faith, as modeled by her parents, was the fabric of who she was, and was evident in every interaction. She loved being with her Mom and Dad, as a kid and adult and was the kind of sister that loved and truly cared for her brothers. Pam expressed her gratitude that Meg allowed them all to be a big part of her life. When her oldest brother would be deployed as a Navy Commander, Meg would go to his room and simply sit there and pray for him. It was her way of saying she missed him too. Meg wanted to be a missionary and would show an extra measure of grace to those she knew and didn’t; she would pay for the stranger’s meal while going through a drive through. 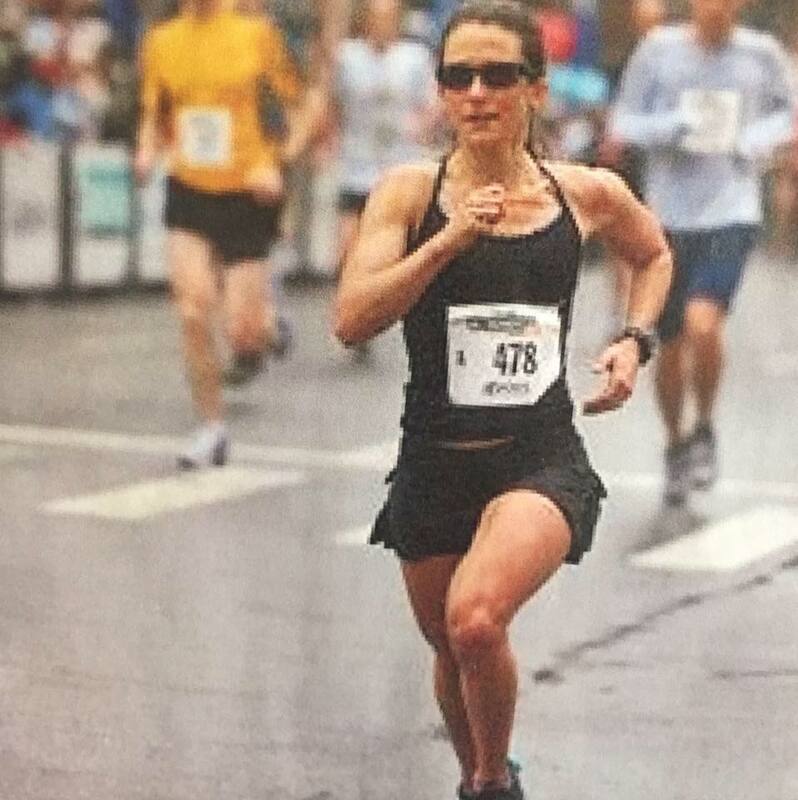 Meg also became a wife and mother to three children, and even though she was training and competitively running (she was incredibly fast and close to breaking a 3 hour marathon time), including qualifying for Boston, what was remarkable was that she placed priority on slowing down and always being present with those around her. The corner of Patrick Henry and Hickory Hill Road, in Hanover, VA on January 13, 2014. Whenever I ask that question of those who knew Meg, they never forget where they were. The road called her home that day, an agonizing one for all who knew her. I did not have the pleasure to know Meg, yet I am grateful to have become good friends with her family and many of her friends. As I have written about her story and impact, and that her still pictures move hearts, I find my heart moved to tears while writing. It is said that grief has no rules, it comes and goes in waves and can be stop us in our tracks. Pam shared that there were days she could not even drive out of a parking lot and getting through the next hour was all that she focus on. At first it was one pair of sneakers on a road sign at the intersection of Patrick Henry and Hickory Hill Road, left by one of Meg’s running teammates from her Sportsbackers Marathon Training Team, then it became more…much more. It became a community that truly cares about each other and lifts each other up through challenges and struggles, as Meg did to those around her. 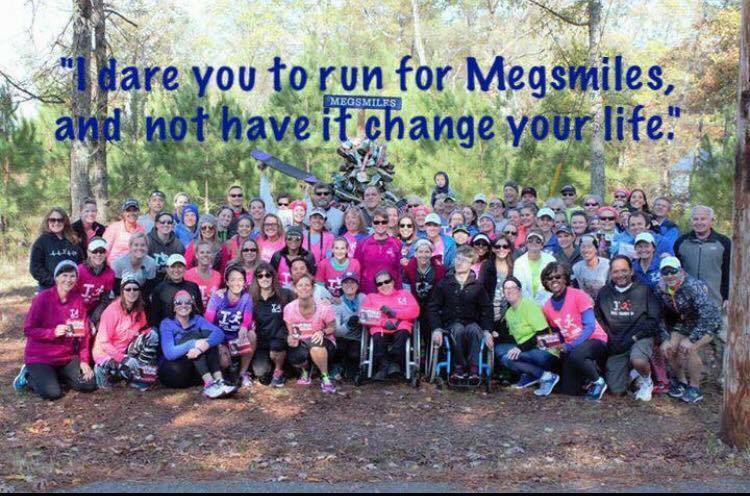 The first weekend after Meg’s passing nearly 100,000 people from around the world ran for her. Pam and Wirt thought that would be it. Then as months, and now years, went by they never dreamed Megsmiles would become what it is today, namely glory out of ashes. Pam feels it is Meg’s way of surrounding her family with love, encouragement, and support until they are together again; she is very close to many in the group and feels she has known them her whole life. What did Meg love about running? It was sharing the miles and the running community, and what is evident in the days, months, and now years since that day that Meg ran her last mile is that purpose can certainly find us through storms and we can get through it if we run as one. August 1, 2014, I went for a run at Hickory Hill after work as was training for my first ever half marathon. I live close by and it is very scenic, the major traffic on that road is tractors and hay balers. Running there also brings reflection as it takes me to the beginning of a journey that encouraged me to take a chance and follow my heart when I ran my first marathon in 2015. It was Meg’s birthday and the first one her family would have without her. As I finished my run, I came upon the road sign which became Meg’s Memorial. There was a couple there tending to it and as I approached I was asked, ‘Are you Ed?’ And I looked at them both and it was Meg’s parents…you must be Meg’s Mom and Dad. We immediately hugged, how fitting the first people I met In Megsmiles were Pam and Wirt Cross. I have been grateful for their friendship ever since. It was the Sunday of Thanksgiving weekend, 2014. I was driving back home from Northern Virginia down Route 301, it was dusk and at the last minute decided to take a detour. I knew this was the first Thanksgiving Pam and Wirt were without Meg so thought would stop by Meg’s Memorial, reflect and pray for them. As I parked and walked over, saw someone there. It was Wirt spending some time with his daughter Meg. We had a heartwarming and authentic time to share with each other, as I knew he was grieving. I was grateful to be there with him as we told stories and I learned a lot about Meg and what it was like raising her and seeing her into being a wife and mom. For those that read my blog know, I always enjoy spending time with and learning from other Dads, and for those Dads with daughters as I have shared before, there is something about it that adds another dimension to a man’s soul, it softens and adds tenderness and at the same time makes it more valiant and protective. That was evident with Wirt; Meg your Dad loves you with all his heart and though he can’t be with you now, knows that you are always with him. When we drive by Pam and Wirt’s house and farm, we often stop by, for Cross Family Produce. A farm stand in their front yard and when we do, my wife Angela and I love spending time with them. That is the way they are, showing an extra measure of grace to all. We realize we would not have known them had it not been for Megsmiles, and the tragedy in January of 2014, we can’t help think we were introduced in a way none of us wanted. In other words, you are encouraging us all to believe and fly. Believe and fly, on the surface seems that it can’t be done. So did running 26.2 until I did it, yet I knew that I needed to believe that I could. When we are literally jumping into the unknown, doubts certainly can take over. Then again, I am reminded that I would rather soar with eagles. Thank you Meg. God bless you Pam, Wirt, Wirt and Howard for sharing life her with us all. I also want to introduce a new blogger to the community, Pam Cross. When she asked me about it, I did my best to encourage her to do so, as we can all use an extra measure of grace. The domain is up and we look forward to hearing stories and learning from you Pam!